The Fat Tuesday parade, otherwise knows as the Mardi Gras parade, always starts with the running of the boys. What are they running from? The people behind them throwing flour at them. By the time the parade is over, the entire town is engulfed in flour. 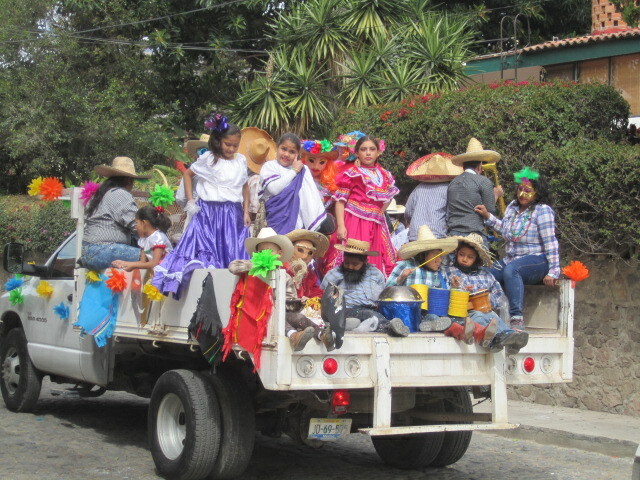 For ten days before the Fat Tuesday parade, there are smaller parades in town. 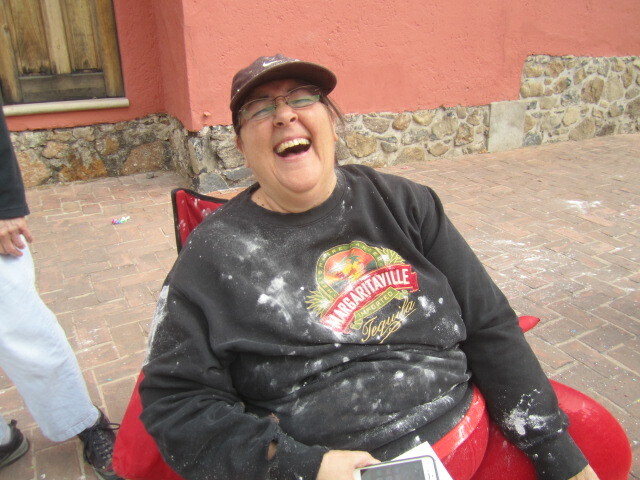 Just about anytime you walk into town during these ten days, you are likely to run into a parade and a face full of flour. Great fun. 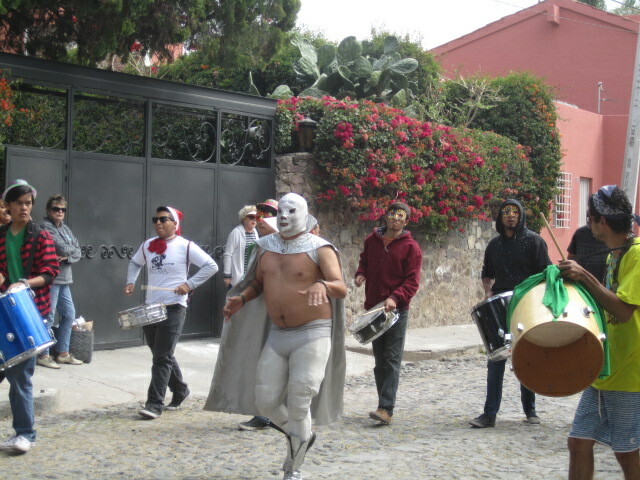 The photo below is of the next group, carrying flour in all kinds of containers. Some of these people are men dressed like women. Some are women dressed like men, some, well I have no idea who or what they are dressed like and I didn’t want to get close enough to take their photographs because I didn’t want my camera or myself to get floured. 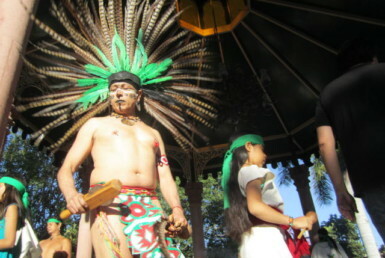 There are many holidays in Mexico. 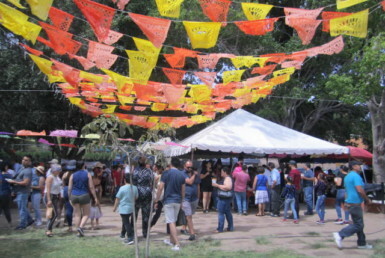 This carnival season, before Lent, is one of the biggest. There are three different kinds of national holidays. Statutory holidays where schools are closed and government employees have paid holidays. There are 8 Civic holidays where employees are not entitled to paid days off. 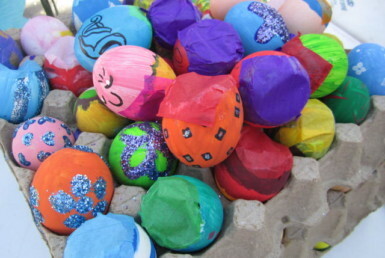 There are 13 Festivities honoring religious events, Mother’s Day, Father’s Day, etc. There are 23 Totaling 47 holidays and this is only the beginning. There are many more local holidays besides these national ones. How many local holidays are there? Countless… Every time I turn around, there is a holiday of some sort. I wonder if it is possible for there to be more holidays and celebrations than plain old ordinary work days. 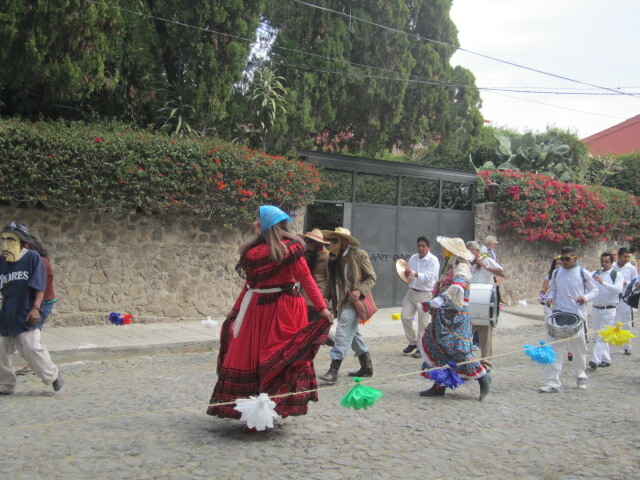 And then there are all the holidays and festivals created by the expats. In February there is the open studios event where you can visit the studios of local artists. And there is the Northern Lights Festival and the Chili Cook Off. Need I go on? Is this a man or a woman in the above photo? I am guessing a man. 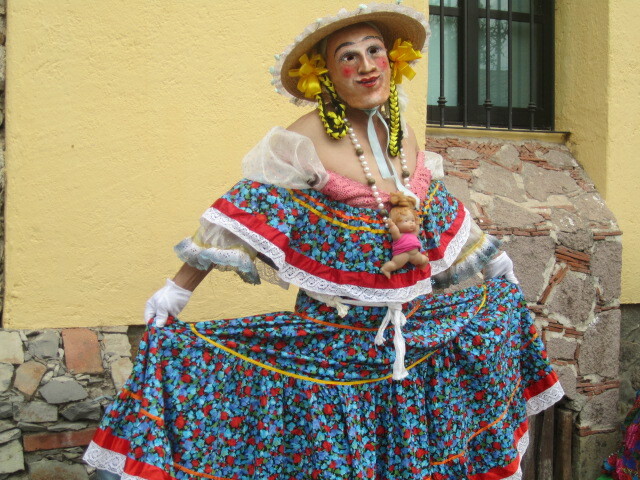 A Sayacas. That is the name of men who dress like women. Such an innocent pose he/she has for the photo. I like the doll necklace. But where is the sack of flour? Hidden most likely. 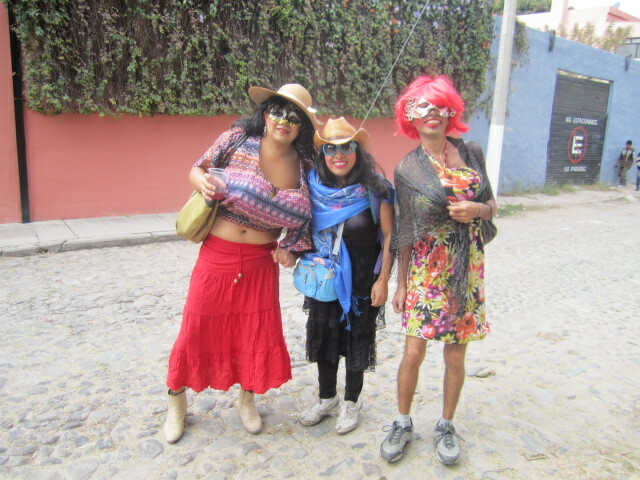 Three happy women in costume (Maybe they have flour to throw in their purses.) I am pretty sure these are all women. Here are some Sayacas. And a band. I like the Sayaca in the front with the beautiful red dress. 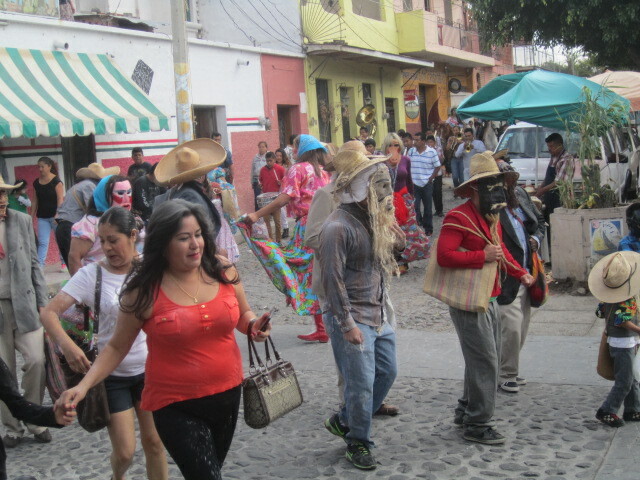 There are also men wearing masks of old men. They are carrying purses filled with flour. There were a lot of floats in the Fat Tuesday parade. Looks like a carnival queen standing at the top of this one. Most of the people riding in floats were throwing out flour or confetti into the crowd but a few threw candy. I liked the candy best. The float above was beautifully decorated. 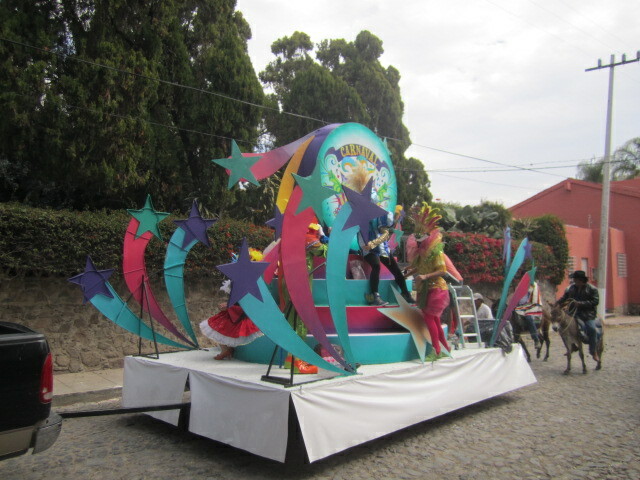 The floats are commissioned by businesses or organizations. This one was for the carnival. Behind this float were two men riding on donkeys. I also don’t know the significance of the donkeys. Maybe no more meaning than it is fun. 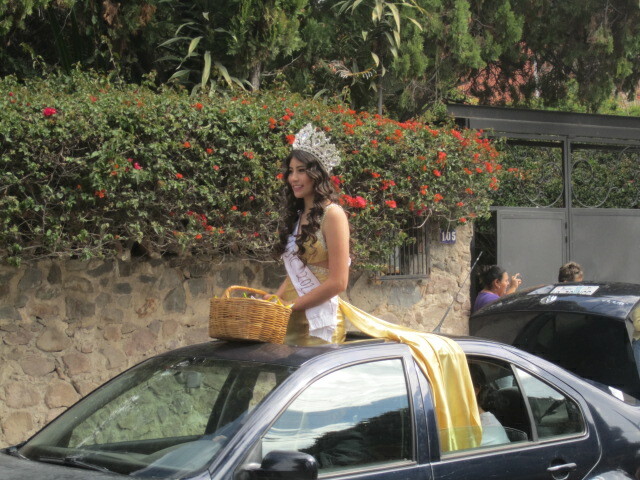 I am guessing that she is another carnival queen. I didn’t get close enough to read her banner. What is a parade without beautiful women? 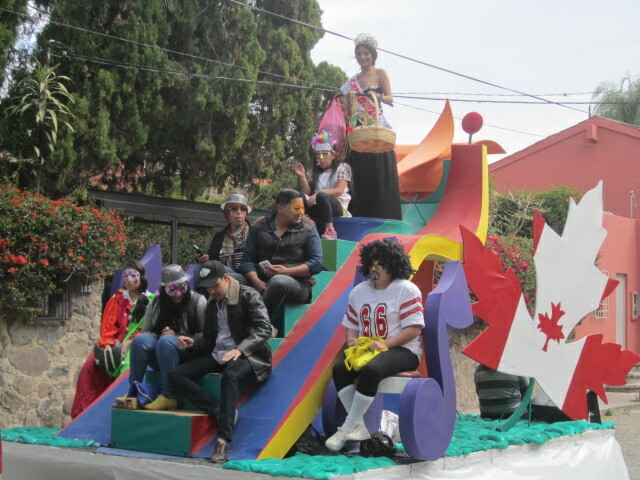 The float in the above photo was packed with men, women and boys and girls, all in costumes. 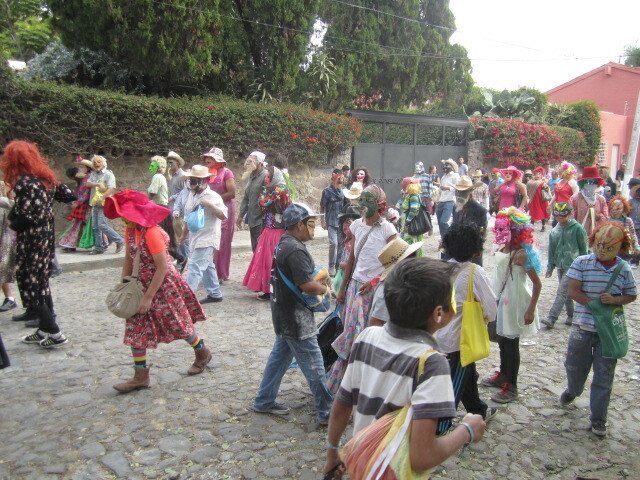 I liked the big Mexican hats and drums made out of cans. Very creative people. Above is another float about the carnival. Filled with happy people in costumes, throwing flour. 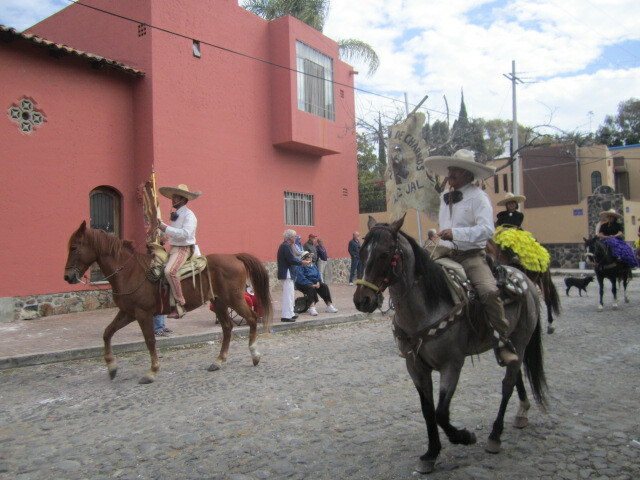 The women wearing the purple and yellow skirts are the Escaramuza riders. They perform dangerous rides in various formations, weaving in and out of each other. Two photos of the bands. I like the man dressed like a wrestler. 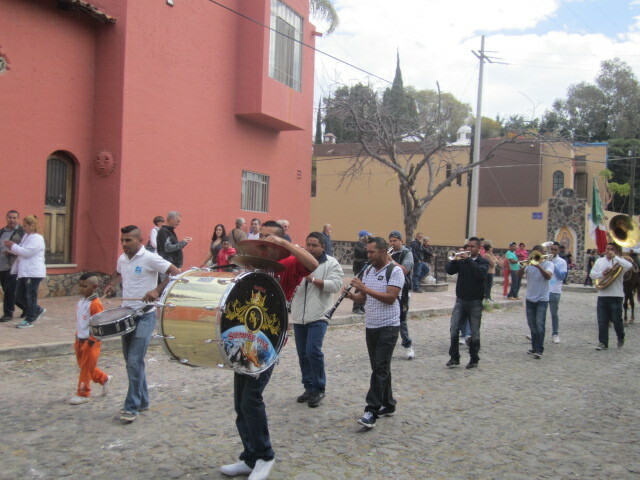 The next three photos were of a previous parade. I was near the Ajijjic plaza when I took them. 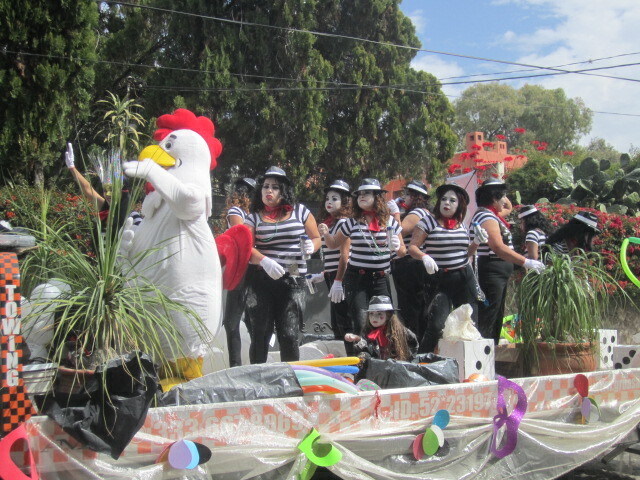 I wanted to include one of the other parades in this article too. 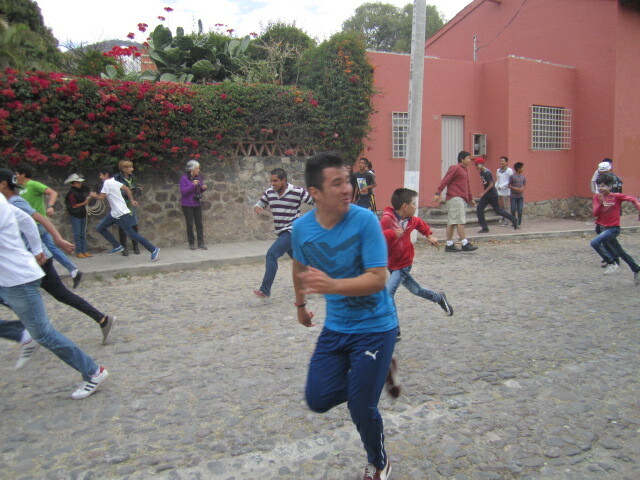 They were all fun and the town has had lots of flour on the streets for days. 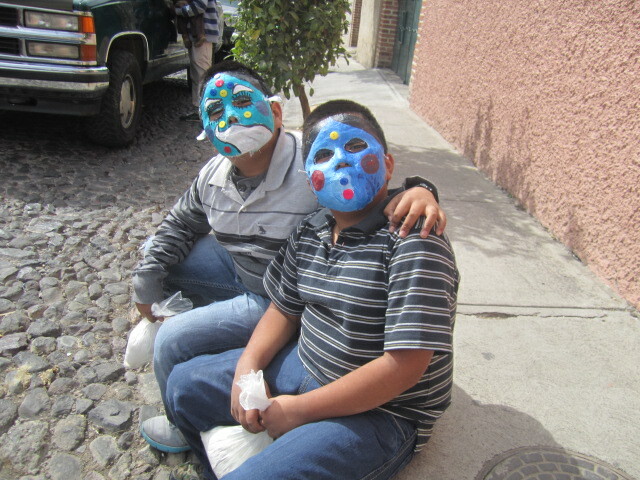 Check out the plastic bags in the hands of the boys in the photo above. They are ready to throw flour. I was lucky that they didn’t decide to throw some on me. I did my best to avoid being floured, mostly because I didn’t want flour in my camera. But not being floured is a rarity during this season. The boy in the above photo wasn’t so lucky…. 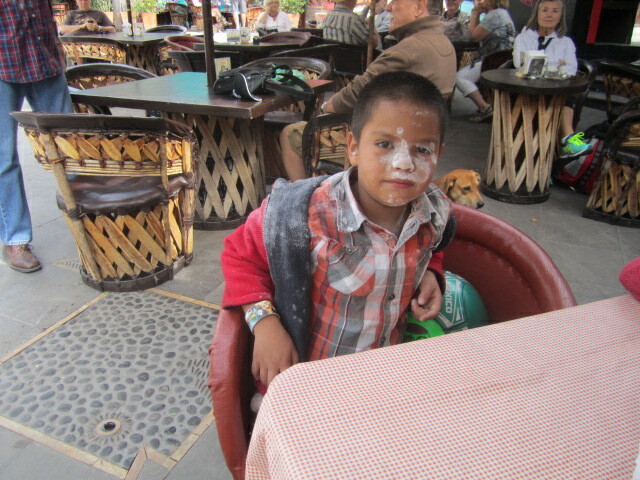 Flour was all over him. I love the photo above because of the expressions on the faces of the two boys. The one in front is so excited he can hardly keep still. The one behind him seems to be wondering what all the fuss is about. He is more interested in me taking his photo. 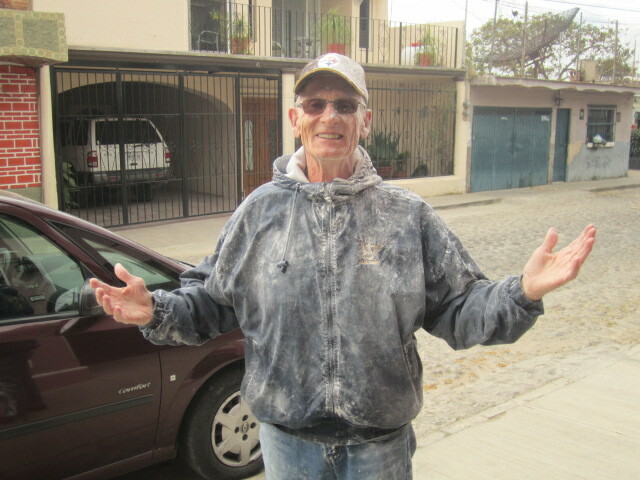 This expat was proud of the flour on him. I like to see the expats get into the Mardi Gras spirit. The woman in the above photo is a friend of mine. Her name is Pam. She just recently moved down here and this is her first Mardi Gras parade. She was having a lot of fun. 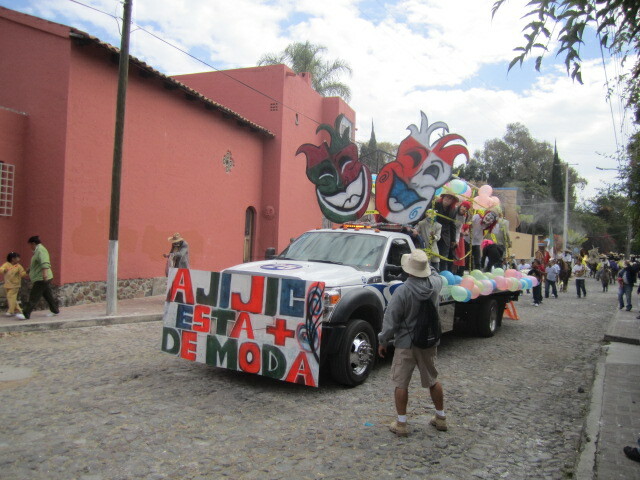 If you are ever in Ajijic during this time of the year, I hope you will stop and watch the parades. You won’t be bored but you will be white with flour. Fantastic pictures,enjoyed!!!!!!!!!! Can’t wait to get back to Lakeside. 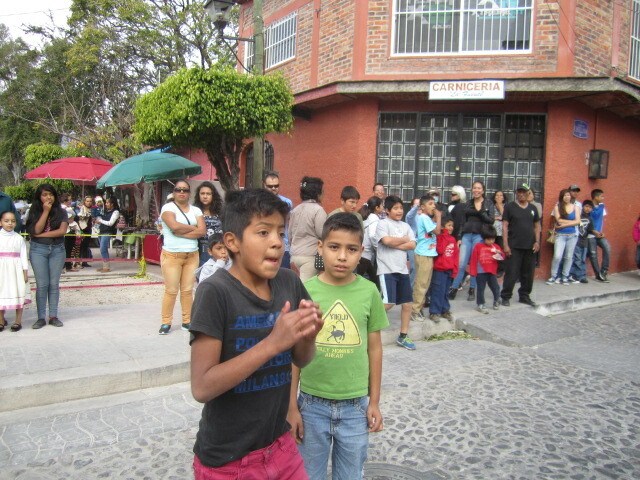 Hello, I am interested in knowing what Ajijic is like for gay people. Is it gay friendly?